Prominent & Leading OEM Manufacturer from Delhi, we offer rubber wheel chocks, rubber wheel stopper breaker, aircraft wheel chock, aircraft rubber wheel chocks and bathroom fitting rubber. 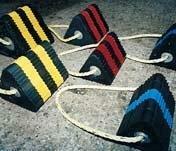 Wheel ChocksPolytec offer a selection of wheel chocks suitable from small vehicles to aircraft. 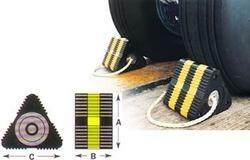 Wheel chocks are used to prevent movement of vehicles or aircraft's in many applications. 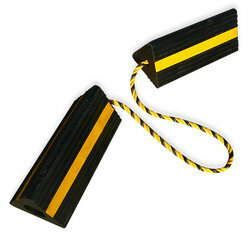 Speed BreakersSpeed Breaker: One of the most widely used products which we supply all over India. Speed Breakers are essential to reduce the risk of accidents under any environment involving vehicular movement. Our speed breakers are hassle free and perform under extreme conditions due to which they are used by several private and public sector companies. Chocks are one of the essential pieces of ground equipment for every aircraft owner, as they prevent your plane from moving until you’re ready for it to move. There are many different options to choose from when it comes to aircraft chocks, and we are able to deliver almost any type of aircraft chock to you as soon as tomorrow when you place your order today. Our aircraft chocks for sale are made of sturdy and durable materials, so you can count on them to steady even the biggest commercial aircraft.